George Bush and the Obituary Wars. The former president had just died. In Behar's view, it was a moment to recognize any merit in the man and his legacy. Many of his followers disagreed. They depended on Behar for righteous liberal passion, which left no room for such Bush-flattering adjectives and phrases as "good," "decent" and "a life of dignity." How dare Behar lavish them on a man who leaned on the despicable Willie Horton ad, who nominated Clarence Thomas to the Supreme Court, who did too little in the face of AIDS, whose privilege often blinded him to need. They lashed out at Behar. They unfollowed him. And they demonstrated the transcendent curse of these tribal times: Americans' diminishing ability to hold two thoughts at once.Bush has indelible stains on his record. He also has points of light. At times he failed the responsibilities of leadership. At times he did right by them. He showed folly and he showed wisdom, cowardice and courage, aloofness and kindness. Accentuating the positive, especially in the hours after his death, didn't eliminate the negative. Behar said as much in that tweet, beginning it by alluding to disagreements with Bush's agenda. No matter. The blowback came anyway, and he felt compelled, in a subsequent tweet, to explain, elaborate, justify. "I'm not endorsing Bush's AIDS policies," he wrote. Nor, he added, was he expunging Willie Horton. "I found both to be repugnant. Nevertheless I sensed a fundamental goodness in his post-presidential life & wish his family compassion. 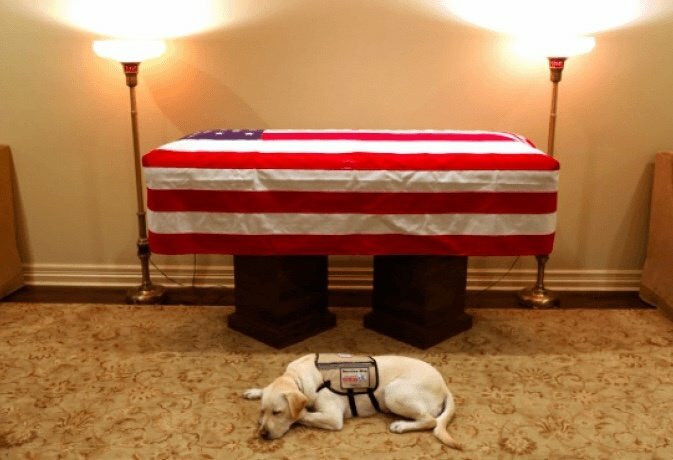 "And in another tweet: "I can't believe the number of followers I've lost tonight for benignly expressing sorrow about President Bush's passing. Apparently, to them, I failed some ultraprogressive litmus test." Should it be this hard? This tortured? I don't know Behar or follow him on Twitter, but the reaction to his initial Bush tweet and his response to that became a kind of cause célèbre among some people I do know. They talked or tweeted about the whole episode as an example of how fractiously far we've fallen. The television commentator Nicolle Wallace, the former United States attorney Preet Bharara and Lanny Davis, the prominent Democratic lawyer who represents Michael Cohen, all publicly expressed support for Behar. The tussle over remembrances of Bush echoed the tussles over remembrances of Senator John McCain, when detractors howled about any framing of him as a hero — McCain, who was captured and, for years, tortured by the North Vietnamese and who refused early release unless his fellow prisoners were also freed. Yes, there were issues, grave ones, to be taken with his positions on American military intervention and with his domestic record. But there was valor galore, across decades of public service, and it's possible, even imperative, to acknowledge and celebrate that.That's not to say that Bush or McCain, even in death, warrants only tributes. A mix of appreciations and censorious assessments is in order, and it's very much arguable that the first wave of takes on Bush, including one that I wrote for The Times, tilted excessively toward the complimentary. A person can find Christine Blasey Ford credible, believe that Brett Kavanaugh lacks the temperament for the Supreme Court and also worry about a pile-on against him that laid waste to the concepts of due process and presumption of innocence. But the public battle lines were drawn in a way that left little room for that. For that matter, a person can detest the conservative stacking of the court — and seethe over the manner in which Mitch McConnell blocked Merrick Garland — and accept that Trump, in elevating Kavanaugh and Neil Gorsuch, didn't commit some treachery or abuse his office. He fulfilled campaign pledges and reminded us that elections have consequences.A person can deplore Trump's recklessly inflammatory characterizations of illegal immigration and treatment of migrants while acknowledging that secure borders are a legitimate concern. But that's not an analysis I hear often on cable news. We like our villains without redemption and our heroes without blemish, and we frequently assign those roles in overly strict alignment with our ideology. Behar's tweets about Bush broke from that. And some of his followers didn't mind. He even gained new ones — proof that all isn't lost. But we do seem to be getting worse at complexity. At nuance. At allowing for the degree to which virtue and vice commingle in most people, including our leaders, and at understanding that it's not a sign of softness to summon some respect for someone with a contrary viewpoint and a history of mistakes. It's a sign of maturity. And it just might be a path back to a better place. Post Script. I don't believe in false sentimentality because of death. I am also uncomfortable lightly calling some of George Herbert Walker Bush's actions merely “mistakes," as Bruni does. People died because of them (AIDS, Iraqi War) and racism and sexism thrived because of them (Willie Horton, Clarence Thomas). That said, I share Frank Bruni's goal - a gentler America in which we speak more kindly to each other and recognize our shared humanity. 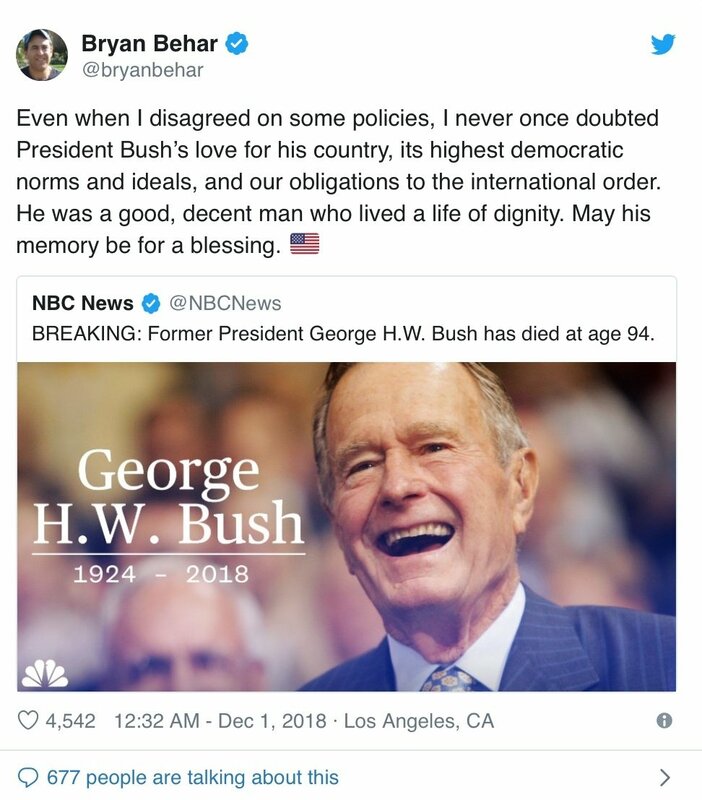 At the news of his death, people went over the top in praising GHWB, because of the lack of grace and meanness of the beast in the White House. We yearn for heroes and a gentler tone. A human being has died. We feel for his family, his friends, his dog. The nation says good-bye today.